The Cooler Master MasterCase SL600M features a "clean lines and angles" design principle. 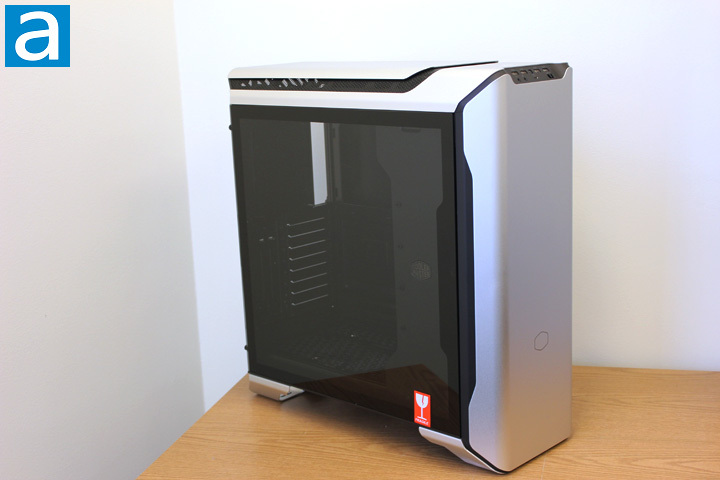 With the help of the vertical chimney effect layout, there is no need to have any air intake mechanism at the front panel, and the result is a single piece aluminum panel seamlessly attached to the computer case. There is also an aluminum top cover. Things such as the cooling bracket and ventilation filter mesh are all discreetly hidden underneath the cover. It is worth noting the top cover is not attached to the case using screws. Instead, there are three clips that allow you to raise up the cover a little bit. For the top cover panel, raising it up allows the hot air to be expelled out more easily, which should help the cooling performance of any closed loop liquid cooled radiator or fan in your rig. If you do not plan to put any fans or radiator on the top panel, the cover panel can be lowered to prevent dusts getting into the computer. Since the front panel is a solid piece of aluminum, there is no opening for optical drive. It is quite odd to see a modern case with openings for optical drives. A Cooler Master logo can be found at the front panel. However, you cannot find the words "Cooler Master" in that logo, which makes the front view of the case looking very sleek. As you can see from the above picture, the majority of the left side panel of the SL600M is made out of tempered glass. This glass is pretty thick so you should not need to worry about the rigidity of this panel. The downside is it is heavy. The glass is tinted black, which is nice if your LED strips in the case are overly bright. I find the glass is pretty high quality and there is no distortion I can observe. The whole glass window is firmly attached to a steel frame. The steel frame allows the side panel to be mounted on the case using thumb screws. The glass panel can be removed just like a conventional side panel, which is a nice feature if you do not want to see any screws or clips from the tempered glass side of the case. When it comes to the measurements, the Cooler Master MasterCase SL600M is 242mm in width, 573mm in height, and 544mm in length. For a mid-tower, the size is definitely on the large side. 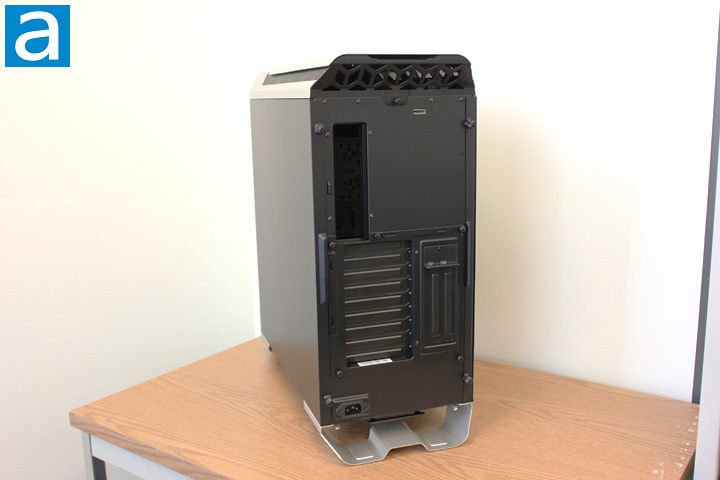 Compared to the MasterCase Pro 6 I reviewed before, the SL600M is even bigger. The computer case weighs at 13.6kg, which is heavier than the MasterCase Pro 6. This is due to the use of the tempered glass side panel and its bigger footprint. All the front I/O ports and switches are located on the edge where the front and top panel joins with each other. There is a little flat surface that divides the front and top aluminum panels. All of the front I/O ports and fan speed switch are located on that little flat area. 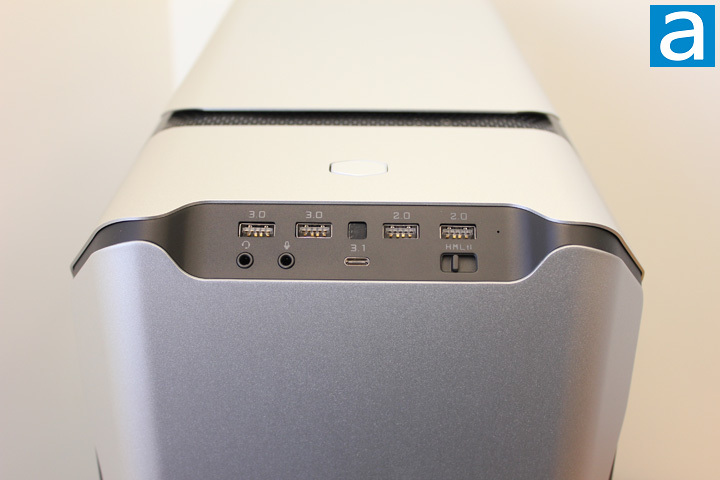 Note the power switch is on the top aluminum panel and has the shape of the Cooler Master logo. There is no reset button on the SL600M. For the front I/O ports, we get two USB 3.0 ports, two USB 2.0 ports, one USB 3.1 Type-C port, and audio jacks for headphone and microphone, respectively. In the introduction, I mentioned the computer case is smart enough to illuminate the backlit USB ports automatically when the user needs to get access to those ports in the dark. This function is realized through a motion detection sensor located between the USB 3.0 and USB 2.0 ports. Once the sensor detects the presence of the hand movement near the USB ports, the USB ports are illuminated. I think this feature is very useful for places like the bedroom, since no one wants to see light coming from the computer when he or she is trying to sleep until they need to access the ports. The back of the Cooler Master MasterCase SL600M, like the rest of the case, is simple and clean. There are two major sections; namely, the motherboard I/O backplate and expansion card slots. The position of the motherboard I/O backplate is as expected. However, for the expansion card slots, there are two groups of them on the bracket. The group of expansion card slots on the left hand side is the conventional configuration, and there are nine slots in total. On the right hand side of the conventional PCI expansion card slots, there are two slots for the vertical graphics card mounting. You can also rotate the PCI bracket for better clearance from the glass side panel to the graphics card. It is worth mentioning that, in order to mount the graphics card vertically, users need to buy the riser cable themselves, since it is not included out of the box. You may have noticed that, for the SL600M, there is no PSU mounting plate and rear exhaust at the back of the case. The PSU is actually mounted behind the front panel, which we will get there later. A standard power plug can be found near the bottom left side of the back panel. The lack of rear exhaust is due to the vertical chimney effect layout of this case. The air intake is at the bottom of the case, and the exhaust is on top of the case, therefore there is no need to have the rear exhaust. The back side of the MasterCase SL600M looks cleaner than most of the conventional computer cases in the market, thanks to its unique PSU mounting position, and the use of vertical chimney effect layout. There are two aluminum stands at the bottom of the case to support the heavy Cooler Master MasterCase SL600M and rise the case up about four centimeters on top of the resting surface for better ventilation performance. These stands may not look very thick in the picture, but they are actually extremely strong. I guess the material used by Cooler Master is the high quality aluminum alloy, although they did not use "military grade aluminum" in the advertisement like Ford, haha. You may not be able to tell from the picture, but the stands are a little bit rough on the edges. I think these stands need some better machine work, or at least a little bit of grinding, so that the chance of users getting cut by the sharp edges can be reduced. Four rubber bricks are provided to enhance the grip of the stands. These rubber bricks can offer enough friction to hold the case in position firmly. You can also see from the above photo a washable filter is attached to the bottom grille of the chassis. The filter is reinforced by a hard plastic structure, and they are removable for cleaning as well. Note the case features a chimney-like layout, therefore there are two giant fans mounted at the bottom of the case. 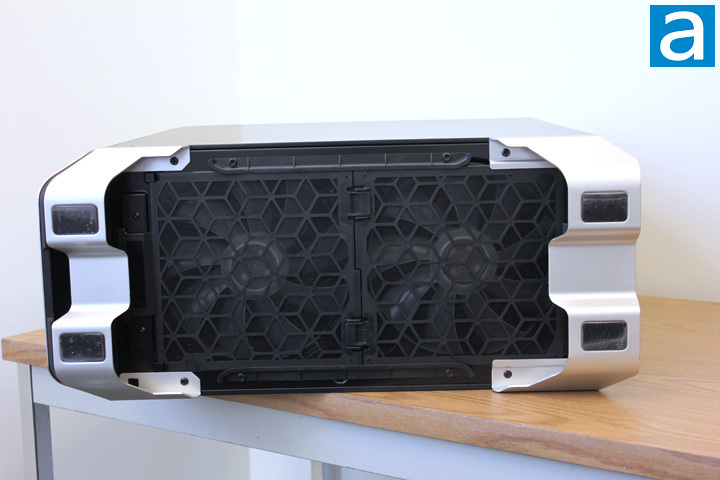 The fans are included in this case, and they are 200mm in size. The fan speed can be adjusted from 400RPM to 800RPM through the switch under the USB ports. These two huge fans should definitely help with the cooling performance of the SL600M. Overall speaking, the design of the MasterCase SL600M is clean and smooth. Thanks to the one-piece aluminum front panel, vertical chimney effect layout, and unique PSU mounting position, the case looks nice and sleek. The only suggestion I can make is to improve the machine work of the aluminum stands, so the edges can be rounder and smoother instead of being sharp. posted 3 hours and 10 minutes ago, with 15 posts.